Gotz Aquini dolls are bath dolls for children. This little Aquini doll is 33cm tall and has a full vinyl body that is anatomically correct. She has blue closing eyes and a hair-free head that is delicately moulded and painted brown to resemble hair. She comes with a pink hooded towel edged in the same fabric as her dress. She wears a leaf print sleeveless summer's dress in greens, turquoise and pink, and it's embellished on the bodice with a colourful sequin toucan perched on a branch. On the shoulders are hot pink satin ribbons stitched into loose bows. Aquini wears a sunhat from the same beautiful patterned cotton fabric. She wears pink glitter rubber croc-style shoes on her feet. 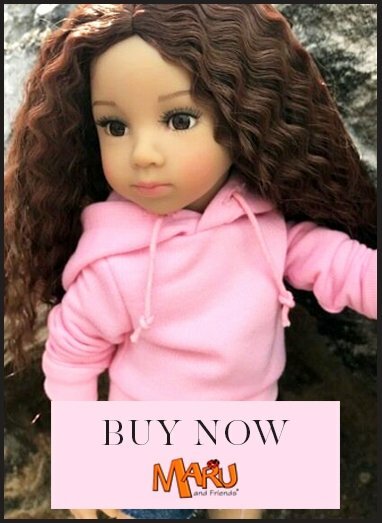 Gotz Aquini dolls are bath dolls for children. This little Aquini doll is 33cm tall and has a full vinyl body that is anatomically correct. She has blue closing eyes and a hair-free head that is delicately moulded and painted brown to resemble hair. She comes with a pink hooded towel edged in the same fabric as her dress. She wears a leaf print sleeveless summer's dress in greens, turquoise and pink, and it's embellished on the bodice with a colourful sequin toucan perched on a branch. On the shoulders are hot pink satin ribbons stitched into loose bows. Her limbs swivel and her vinyl is soft to touch. She's 100% waterproof and suitable for children 3 years and up.